How do you enter? Download the Just Beer App, and/or create an account on justbeerapp.com; then follow @justbeerapp on Facebook, Twitter, or Instagram; then like, share, tag a friend or comment on one of the Just Beer posts from any of the those social pages. Step 1: Download the Just Beer App and create an account on Just Beer. Step 3: Like, share, tag a friend, or comment on one of the posts from the Just Beer social pages. 1 Synek countertop beer dispenser. *Contest ends June 7th, at 11:59 PM. Winner will be contacted through the site they used to enter the contest and will have 48 hours to respond, at which point a new winner will be selected if there has been no response from the original winner. 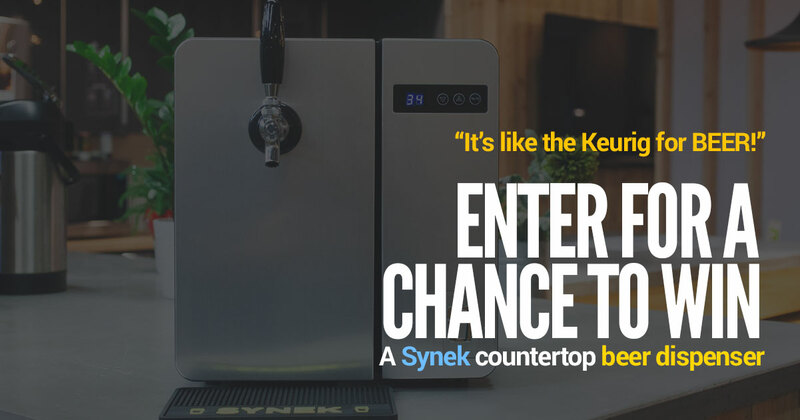 This contest is for a single Synek countertop beer dispenser and does not include beer inserts. This contest has no cash value and the prize is not exchangeable for monetary value. No purchase necessary. Must be 18 years of age or older. Here are the front-runners for the #beTheBrewer contest with @abbeerfestivals and @justbeerapp. If you’re submitting a design, today is your last day for entering so submit soon! Want to ride around this summer in style? Enter to win a wicked cool Big Rock custom bike. National Beer Hall on 17th Avenue in Calgary and Fernie Brewing Company have united to get your creative juices flowing. Will your design be the next great Fernie T-shirt?